Most customs are a compromise between form and function. 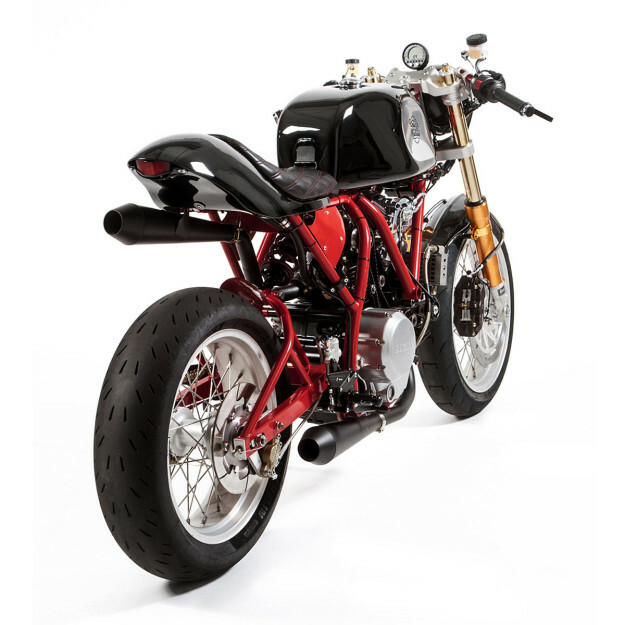 Michael Woolaway is firmly on the side of function—so we’re guessing this new build from Deus’ LA workshop is a blast to ride. 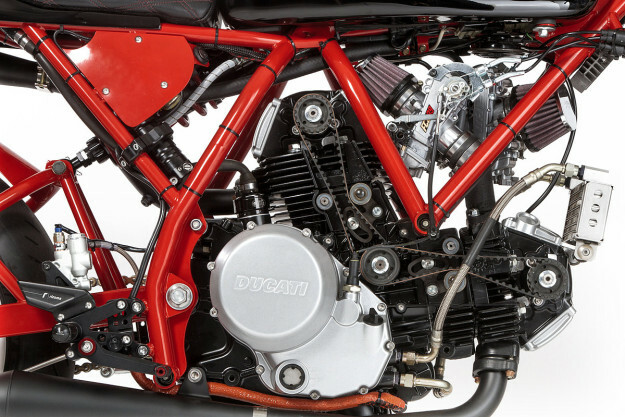 A quick look at the engine casings of ‘Dreamliner’ will reveal Ducati power. But the rest of the bike is a ground-up build. The client wasn’t after heaps of horsepower, though. So Woolie went with an older, 750cc two-valve motor for its simplicity. 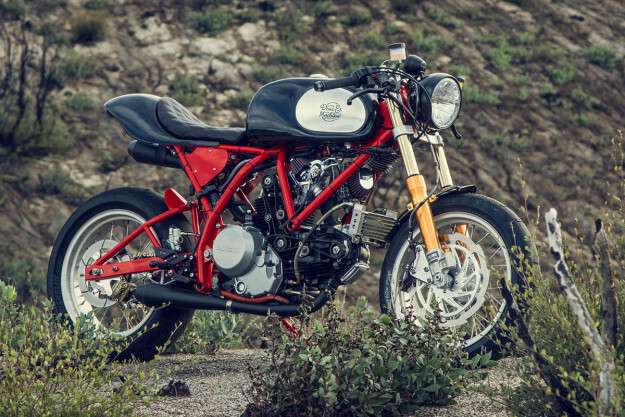 The air-cooled, 90-degree desmo V-twin has been rebuilt from the ground up. Woolie’s also modified the intake manifolds, so he could replace the usual 38 mm Mikunis with a set of Keihin FCR flatslides. 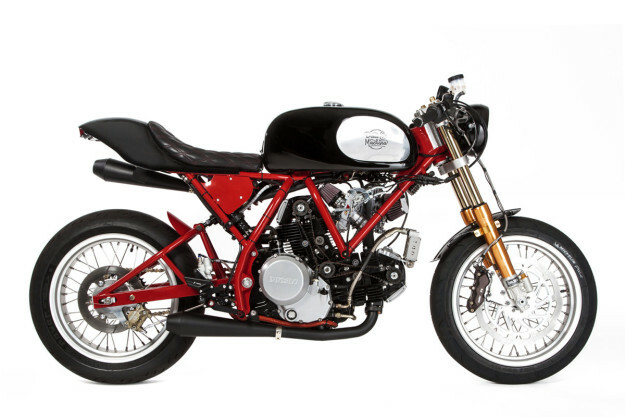 The exhaust headers are custom, inspired by the 1970s Imola Desmo racebike, and hooked up to a pair of Cone Engineering mufflers. 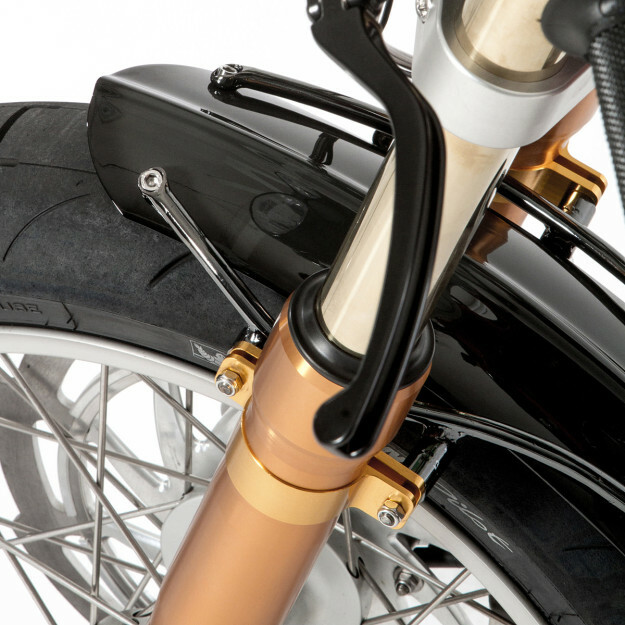 The frame itself is incredibly light—a one-off chromoly unit—and attached to a set of conventional Öhlins forks. They’ve been re-valved by Ed Sorbo at Lindemann Engineering, and adjusted for the owner’s weight. The rear shock is a custom-built item from former flat track racer Jimmy Wood at Race Tech. For the bodywork, Woolie rolled the tank and seat out of 1100 aluminum alloy. 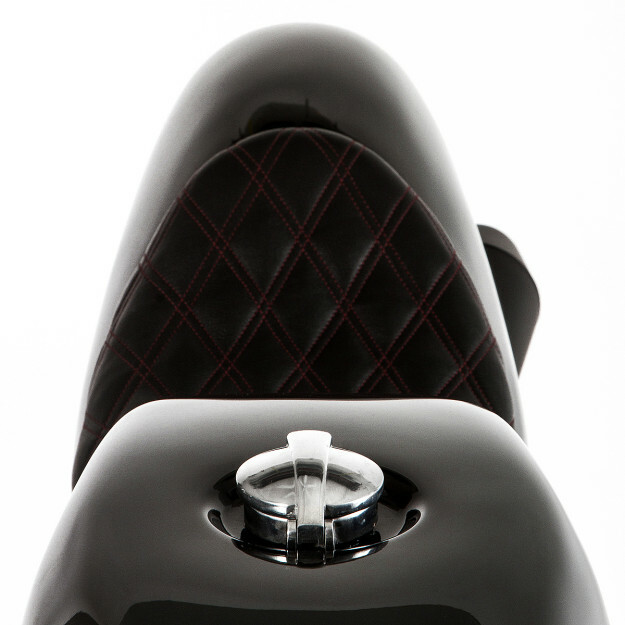 He’s used Kushitani waterproof leather for the seat pad, and finished it off with double tuck stitching. Woolie likes to use USA-made parts as much as possible, and to support people he knows. “Just as I was scratching my head about what wheels to use, into the shop walks Sandy Kosman from Kosman Specialties. The triple clamps are from Richard Pollock of Mule Motorcycles, another old friend from Woolie’s flat track days. 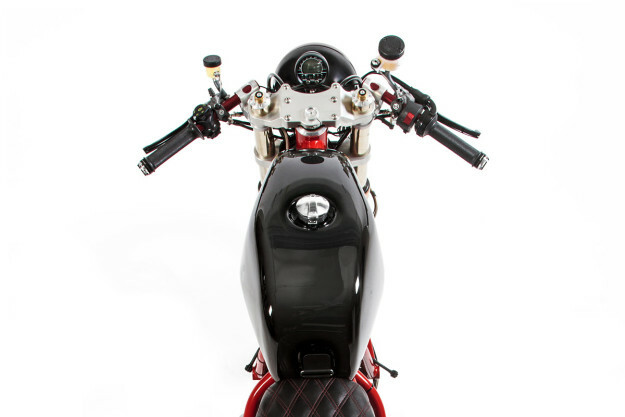 Rizoma provided the rear-sets and a mirror, while LSL supplied the clip-ons. The speedo is a digital Acewell item. When breaking in the bike, Woolie used Michelin Pilot Power One race rubber. He’s now switched to more practical (but still grippy) Pilot Power 3 road tires. If you’re lucky enough to live within riding distance of LA, clear your diary for Saturday 24 January. 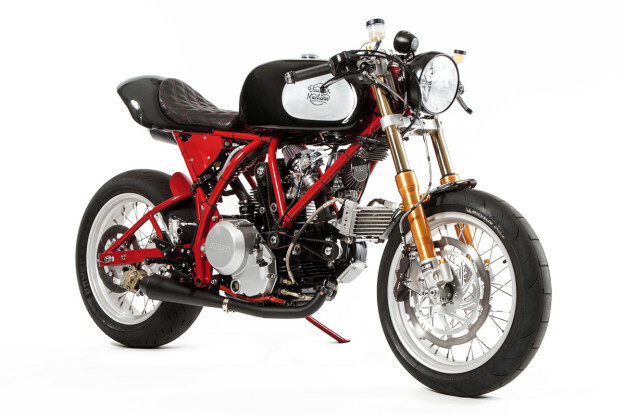 The Ducati will be the star of the Randuno Ducati event at the Deus store in Venice Beach.